Congratulations to all the 2016 Living Green Offices! 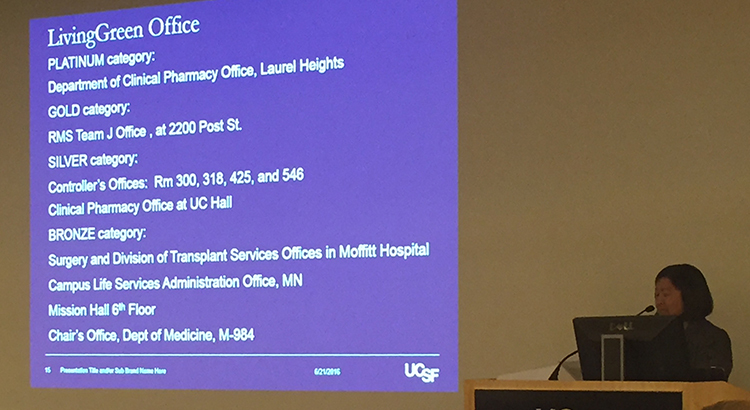 The UCSF Print Management Program is proud to support the efficient printing, copying, and scanning efforts of the following enrolled Living Green Office recipients: Controller’s Offices at MCB, Campus Life Services Administration Office at Minnesota Street, and the 6th Floor of Mission Hall. Visit our “Print Management” page if you are interested in getting your own managed multifunction (print, copy, scan, fax) device for your office – it’s worth 4 points towards your “Living Green Assessment” office score. And visit the UCSF Office of Sustainability website to learn more about Living Green!